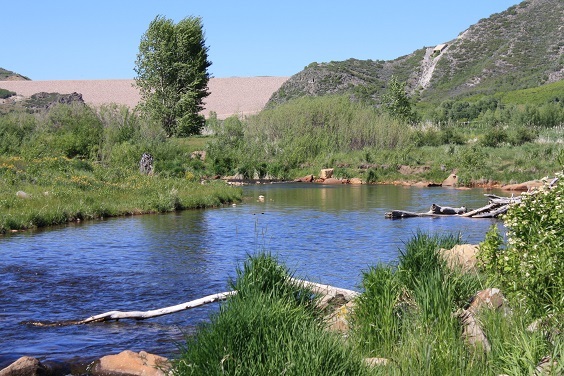 The Provo River is one of Utah's 'Urban Fisheries'. Directions: From I-15, exit 275 (Orem) and take 800 N to mouth of Provo Canyon, follow signs towards Provo, taking State Rd. 189 to the Riverwoods shopping area; or follow the river and find a place of your own! Lower section located from Utah Lake in Provo, up through town, into Provo Canyon, until Deer Creek Reservoir. Middle section is located from Deer Creek Reservoir in Heber (Wasatch County) up to Jordanelle Dam. Upper section is located from Jordanelle Reservoir (Rock Cliff area) upstream to the Mirror Lake Hwy to its headwaters at Trial Lake. (From Jordanelle Reservoir upstream to its headwaters in the Uinta Mountains). CLOSED to the possession of cutthroat and rainbow trout and their hybrids. All rainbow and cutthroat trout and their hybrids must be immediately released. Bait is allowed on this strech. (From Deer Creek Reservoir upstream to the Jordanelle dam). A nice Brown Trout caught with a plastic jig on the lower Provo River. (From Utah Lake upstream to Deer Creek dam). CLOSED to taking of nongame fish by methods other than angling. CLOSED March 1 through 6 a.m. May 1 to protect spawning Walleye.